NEW YORK — Craig Anderson loves New York. The Ottawa Senators goalie made 33 saves in a 2-0 win against the New York Rangers at Madison Square Garden on Sunday and is 7-1-1 with three shutouts in his career at the home of the Rangers. It was the third shutout of the season for Anderson, who made 13 saves in the first period. Anderson made 32 saves in a 2-1 win against the Carolina Hurricanes on Saturday and was not supposed to start the game, but told coach Guy Boucher he felt good. 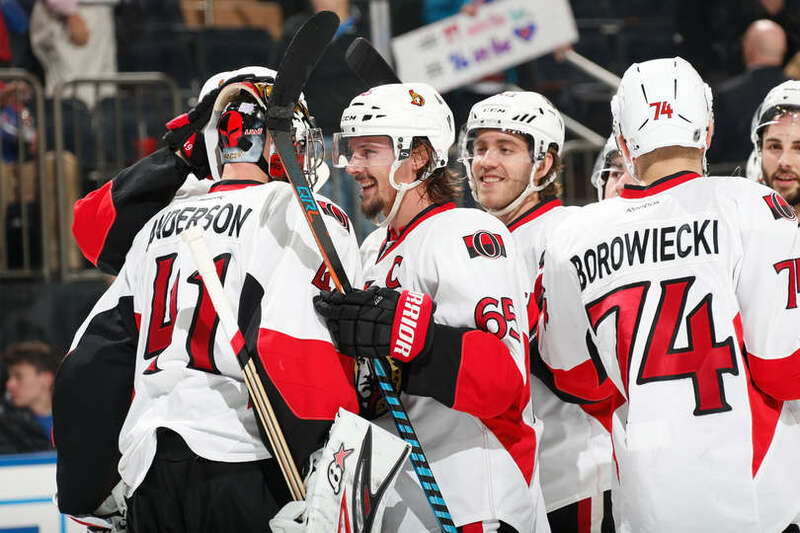 The Senators (14-7-1), who won their season-high fourth straight game, got goals from Jean-Gabriel Pageau and Mark Stone. Pageau gave Ottawa a 1-0 lead at 1:54 of the second period with his third goal of the season. Stone scored his sixth goal on a power play in the second period to make it 2-0 at 16:11 after taking a feed from Mike Hoffman. The Rangers (15-7-1), who have lost their past four home games (0-3-1), were shut out for the first time this season. Raanta made 18 saves in his first loss of the season (5-1-0). Tom Pyatt got the puck behind the net and passed to Pageau in front of the crease, who stuffed it behind Raanta for the first goal of the game. With the Rangers on a power play in the first period, Anderson robbed Brandon Pirri who had an open net after taking a pass from Rick Nash, sliding from left to right to make a pad save at 15:47. Anderson made three saves on a Rangers power play late in the second period to preserve the Senators’ 1-0 lead. Ottawa was 4-for-4 on the penalty kill. Derick Brassard played against the Rangers for the first time since he was traded to the Senators, along with a seventh-round pick at the 2018 NHL Draft, for center Mika Zibanejad and a second-round pick in 2018 on July 18. He spent parts of four seasons with New York from 2013-16 and had 174 points (69 goals) in 254 games, including a career-high 27 last season, which led the Rangers and received a standing ovation when a video tribute was played in the first period. … Matt Puempel played the Senators for the first time since he was claimed off waivers by the Rangers on Monday. He was drafted by Ottawa and spent the first five-plus seasons of his career in their organization. … Ottawa has scored two or fewer regulation goals in 14 of its past 16 games. … The Senators scored their seventh power-play goal of the season, tied for the fewest in the League.